The imposing, bleak compound with tall walls rimmed with coils of barbed wire opened in 1886, making it the oldest operational prison in Washington State. The juxtaposition of the prison structures, watch towers, and fencing set in the beauty of the Palouse wheat fields was startling and jarring. What effect do these visuals of wires, walls, tall sliding metal gates, cement-filled fields, and armed guards have on the human mind and heart? Surprisingly, both groups of men that we met that day came in smiling, eager to connect with us and curious to know what two monastics, joined by their familiar Buddhist group volunteers, might have to offer. The first group of men easily settled into the guided meditation. They were very attentive during the talk and asked thoughtful questions. Despite being quite new to Buddhism, they were receptive to considering the potential of their mind and how it can be transformed through hearing teachings, study, reflection, and meditation. One fellow had read an article recently in a magazine that described some research done with inmates. The article reported that meditation dramatically lowered the rate of re-offending for those who practiced sincerely and continued upon release. This was deeply inspiring for this individual, who is set for release in 2020. He was excited that he had finally found something that would benefit him for the rest of his life. During lunch he said that he believed, had he encountered Buddhism earlier in life, he would not have offended. The second group of 21 men, aged 20-30, were clearly there to partake in re-connecting with their peers, eat a special nutritious lunch, and see what the Buddhists might have to say. The high energy and dynamics of this group, who constantly monitored the reactions of the “leaders,” made this teaching/meditation session more of a challenge. Fortunately, the men were willing to try the guided meditation. They became focused and attentive when they heard about the potential of their mind and that they were not their negative mental states or negative behaviors. 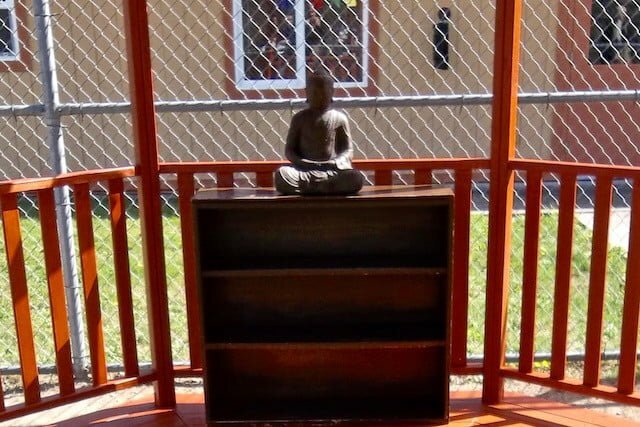 May these inmates continue to grow their fortitude to make wise and kind choices in prison, continue to receive guidance in growing a Dharma practice, and come to see their unlimited potential for goodness.